Your networks are automatically set up when you create an environment. As part of this process, Skytap provides and sets up a domain name server (DNS) for your network. In certain cases you may want the flexibility of using a DNS server you control (such as when you set up a VPN or Private Network Connection). Skytap allows you to override the DNS server that is automatically provisioned for you. Click Networking Settings on the Environment Details page. The Network Settings page for the environment displays. Complete the Custom DNS (primary) field. Optionally, you can also use the Custom DNS (secondary) field to list a second DNS server. 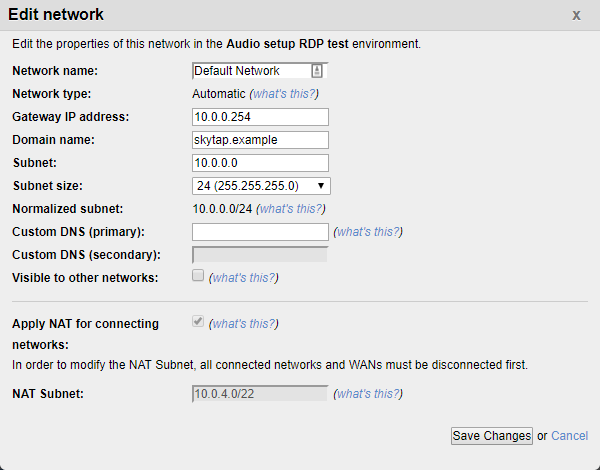 After the DNS is changed, requests to resolve the name of another machine are sent to the custom DNS, rather than the automatic DNS in Skytap. If you need the names of specific VMs to be resolved on a network with custom DNS, you must make entries for these VMs in your custom DNS. Many of Skytap features are designed to work with our automatic DNS. If you use your own DNS, you may notice some inconsistencies in how network information is displayed. For example, the Environments page may display outdated or incorrect hostnames for your VMs. Additionally, you may have to modify the shared drive to work with your custom DNS. For more information, see Using the shared drive with a custom DNS server. For tips on running a Windows domain in Skytap, see Running a Windows domain in Skytap.